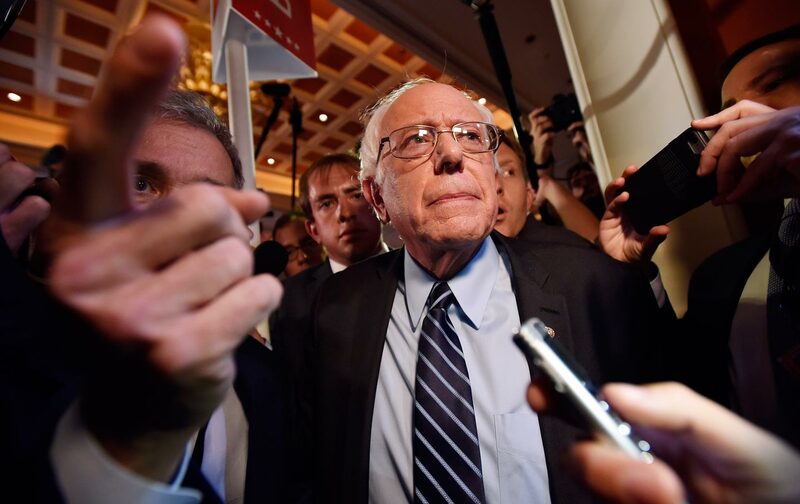 Bernie Sanders has a plan to expand, not “save,” Social Security—and it should be popular. At his inauguration in 1981, Ronald Reagan declared that “government is not the solution—government is the problem.” The election of 2016 will tell us whether the American people are ready to overthrow the tyranny of that reactionary proposition. I know it’s possible—but only if the Democratic Party finds the courage to embrace a serious left turn. The 2016 election is not actually about personalities. It’s about ideas—big ideas for governing that, win or lose, can change the country for better or for worse. Republicans are stuck in the past, still longing for the return of their dead president and his trickle-down Reaganomics. Left-liberal and progressive Democrats are prodding their party to reverse the Gipper in major ways by doing big things that would benefit millions of people—like expanding Social Security benefits instead of cutting them. So despite the media’s trivial pursuits, I expect the 2016 election will ultimately pivot on ideological conflict, powered by the great social and economic dislocations that have shaken society’s self-confidence. Dozens of right-left governing issues are already in play, setting up an emotional clash between bleeding-heart optimism on the left and nostalgic resentments on the right. The most significant of these collisions may be the reemergence of an old and familiar argument about reforming Social Security. This time, left-ish Dems want to expand its benefits and protections and raise the payroll tax on top-level incomes to pay for the expansion. The herd of GOP candidates is once again promising to cut Social Security benefits and maybe turn the government system over to private enterprise (that is, the financial system that wreaked havoc on US prosperity). Veteran campaign reporters evidently think it’s boring, since they seldom mention the issue. But don’t be surprised if the fight over this old New Deal program emerges next year as a crucial battlefront between the parties. In fact, it may provide Democrats with a great opportunity to change the shape of the American electorate and reconnect with disenchanted working-class voters who feel the Democratic Party abandoned them. Social Security is arguably the federal government’s most popular program, more efficient and responsive than most. It is valued by overwhelming majorities across party lines, age brackets and even income levels. It’s supported by Republicans (81 percent) and by Democrats (94 percent) and by independents (91 percent), from Baby Boomers to Generation Xers and to millennials. What is most relevant is that strong majorities in all sectors—even 62 percent of Republicans—think the government should consider increasing the benefits. So why don’t media see the story? The distorted politics surrounding Social Security is itself a scandal. It demonstrates how gravely representative democracy has been eviscerated during the last generation by the political elites and financial interests who claim Social Security is dragging the country to financial ruin. Again and again, high-minded experts in the academy and Washington think tanks issue “Chicken Little” forecasts and mobilize well-financed campaigns to persuade politicians (if not citizens) that Social Security must be pruned back substantially in order to reduce federal deficits. This is an utterly fallacious complaint, but the prestige media have lazily swallowed the propaganda. Missing from their “crisis” stories is any evidence that reporters have actually talked to real people—the workers or retirees who depend on the program. If they did, people would explain that the Social Security payments are actually their money—not appropriations from Congress or Treasury or taxpayers. Working people contribute to Social Security every payday with the FICA deductions from their paychecks. With ordinary citizens left out of the story, sophisticated authorities are free to demonize the old folks as “greedy geezers” who are depriving children and youth of vital necessities. Billionaire Pete Peterson has spent a bucketful of his wealth to create front groups that peddle this lie. Leading think tanks in Washington, right and left, united to pitch it. Two Democratic presidents—Bill Clinton and Barack Obama—collaborated with the scare talk and searched for a “grand bargain” with the GOP to share blame for knifing this much-loved program. The Democrats either lost their nerve or couldn’t close the deal. But geezers can read the newspapers. They knew they were the targets. Maybe this is why people distrust both political parties. Republicans have been portraying Social Security as a “Ponzi scheme” certain to collapse ever since FDR created it in the 1930s (80 years later, they’re still waiting for the crash). But the Wall Street crowd still has a strong incentive to keep pushing right-wing reform. The financial sector would love to get their hands on Social Security’s enormous surplus—the nearly $3 trillion that working people have put aside for retirement in the Social Security Trust Fund. The financiers insist they are better managers than government. After the Wall Street meltdown, that’s a laugh. How can we explain the great gulf between establishment thinking and ordinary folks? The governing elites look at Social Security as a financial instrument and sneer at its supposedly inefficient use of capital. But people think of Social Security as the family—the family’s personal insurance policy that protects them from desperate poverty in old age. But it’s not just for old folks. Family life—unlike profit-seeking enterprise—creates intimate relationships and mutual obligations. If Congress reduces Social Security benefits, the costs of keeping Grandma and Grandpa in livable circumstances do not disappear. They are pushed off on to their children and grandchildren. But instead of celebrating our society’s great achievement of longer lives, financial bean-counters announce that it is a threat to the social order. Social Security is valued by overwhelming majorities across party lines, age brackets and even income levels. The people have got it right. It’s the politicians and economists who are confused. Every time Wall Street has made a grab for “managing” this great store of wealth, working people have gone to battle stations and hammered politicians into backing off. The people didn’t exactly win. But they also didn’t lose. This long-running stalemate demonstrates deep popular loyalty to the program—rare in modern government. It convinced progressives it is time to confront Social Security’s real problem: The benefits are now inadequate for growing ranks of financially stressed retirees. During the last generation, as real wages declined and company pensions disappeared, modest family savings were turned into soaring household debt and an explosion of bankruptcy. In 1989, 30 percent of workers faced a personal income crisis if they retired. By 2010, this crisis confronted 51 percent of retiring workers. This prelude helps explain why Democrats (some Democrats) decided to go on the offense. It is an uphill fight, of course—but not as hopeless as conventional wisdom would assume. The issue speaks directly to what troubles the sleep of millions of families. In the “new normal” economy of flat wages and underemployment, the squeeze on retirement is sure to get worse. So old Dems and young ones are mobilizing to increase Social Security benefits for all recipients and lay off the costs on the high-income earners above $250,000 and the famous One Percent who make only trivial contributions to Social Security despite amassing their great fortunes. This is a gutsy political move for the Dems, because it flatly defies the political establishment’s hoary propaganda. It sets up a stark collision between the broad ranks of disorganized citizens and the dominating power structure of the monied interests. Fat-cat donors will not be pleased, but maybe the people will at last be heard. Without much fanfare, a loose-jointed formation of left-leaning pols and social advocates—liberal-labor reformers, women and minorities, other kindred spirits—is coming together to push for this startling political reversal. They hope to arouse public support for increasing Social Security benefits by 10 or 15 percent while insuring the system’s long-term financial viability as Baby Boomers swell the retirement rolls. Their cause is gaining some traction in Congress. In the Senate, 43 of the 45 senators who caucus with Democrats have already endorsed the expansion principle. A similar list is growing among House Democrats and now around 116, including Representative Steny Hoyer, their party whip. Congress received petitions with 2 million signatures. Legislative point man for this initiative is Senator Bernie Sanders who went beyond campaign rhetoric last year when he introduced the Social Security Expansion Act. Martin O’Malley, the former Maryland governor mayor also running for president, has a similar proposal. In its zeal to dismantle a program that keeps the elderly out of poverty, the Republican Party is an enemy of family life. Sanders would raise the $118,000 income cap on FICA contributions so it would apply to all income above $250,000. That includes a new 6.2 percent tax on investment incomes—what economists used to call “unearned income,” since it does not involve work and wages. Thus capitalists would share the burden of supporting the social insurance program. Actuaries at the Social Security Administration vetted the Sanders bill and confirmed that it would, over a 15-year phase-in, represent a 15 percent increase in benefits for new retirees. This upward adjustment would impact only the top 1.5 percent of wage-earner income. Progressive reformers would not mess with the retirement age. Establishment opinion and many GOP candidates want to raise the retirement age, which is a sneaky way to effectively reduce benefits for all future retirees. But that approach cruelly punishes lower-income workers with hard jobs, because on average those workers die younger than more affluent wage earners. Just as they are finally eligible for early retirement at 62, their lives are often ending. What Sanders and other reformers are proposing is income redistribution by another name. The dollars seem modest—averaging $65 a month—but the social impact is large. Conservatives will insist it is wasteful and claim that middle-class families don’t really need the money. Redistribution is unfair, they argue further, because it forces people at the top end of the income ladder to pay for the middle and the bottom. But advocates explain this modest redistribution just begins to correct for the lopsided maldistribution of incomes during the Reaganesque era of top-down tax cutting and financial deregulation. The One Percenters are the free riders in the American economy, not the poor on welfare nor the struggling middle class. Working people everywhere took the economic hit, while corporate and financial titans were able to avoid personal taxes through notorious loopholes. Many in the media have so far ignored the left-wing agitation but some alert young reporters—like Daniel Marans of the Huffington Post and Alex Seitz-Wald of MSNBC—found the story. They are covering Social Security reform as though it is a serious campaign issue. The lefty political activists are essentially pushing this question: Where’s Hillary? She is obviously the party’s probable nominee, but has not endorsed their cause. Hillary Clinton chooses her words carefully. She wants to “enhance” Social Security. She does not say “increase.” What “enhance” means, she explained, is improving benefits for two worthy groups—low-income retirees and widowed or single women whose work records did not generate sufficient eligibility. Her rival candidates have not attacked Clinton personally, but they are poking away at her reluctance to make definitive promises. Bernie Sanders told New Hampshire senior citizens, “I think Senator Clinton and I have a difference of opinion on this. I think she and I have a strong disagreement on this.” The O’Malley campaign chimed in. “Democrats should have the confidence that our nominee will not cut Social Security, but right now that’s not the case,” his spokesman Haley Morris complained. The expansion advocates are spreading the word and hope to gain a bigger foothold in the media when the primary season opens. They want voters everywhere to confront Clinton with these questions. First, does she promise to veto any legislation that involves cutting Social Security benefits? Next, will she join their crusade for genuine expansion? This sounds like inside baseball and it is, but the question shadows her candidacy. Can they trust her? They are too polite to say it, but they want to paint Clinton into a corner where she is compelled to answer the old question—Which side are you on? The financial establishment and her long association with Robert Rubin and Pete Peterson, her Wall Street donors and policy elites? Or those alienated voters who learned not to trust Democrats named Clinton? Hillary Clinton has already responded to grassroots pleas and pressures on Obama’s free-trade agreement (opposed by labor) and the Canadian oil pipeline (targeted by environmentalists). The Social Security crusade—if it gets visibility—might attract a far more diverse base of voters and working-class enthusiasm, even Tea Party types. Properly understood and honestly explained, the Social Security issue has the potential to become an important voting issue in 2016 that inspires greater turnout across the ideological spectrum. Defending Social Security can convince angry conservatives that, this time, a Democratic president is needed in their family’s self-interest, including in the South. The opportunity requires the Democratic Party to demonize the Republican Party as “anti-family,” just as the GOP demonized Democrats on incendiary social issues. But this time Democrats don’t need to fake the facts or hide from the truth. The Republican Party really is the enemy of family life in its zeal to shrink Social Security or dismantle it. Check out their candidates—nearly all of them have come to believe their own propaganda. They are promising one version or another of breaking up big government’s universal social system—everybody pays in, everybody gets benefits. It would be reduced to just another welfare program typically resented by many working people. The rare Republican dissenter—Mike Huckabee of Arkansas—put his finger on the trap his party is setting for itself. Ohio Governor John Kasich recently assured a New Hampshire audience he has a simple solution—raise the retirement age a few years. When a listener objected, Kasich shrugged him off. “You’ll get over it,” Kasich said. Democrats can tap into the public anger and turn it against conservative wise guys. People believe—correctly—that they “own” Social Security, in the sense that it’s their money at stake. At tea party rallies against Obamacare, remember, citizens shouted, “Keep your hands off my Medicare.” Republicans disingenuously promised to protect them from Obama, when the GOP was promoting the graver threat to Social Security. Personally, I don’t believe it. People rail against big government, but they also rally to defend its best programs. I asked Edsall how he explains the contradictory evidence of the great popular loyalty for Social Security and other universal programs. He agreed that the public may be more confused and conflicted than the social scientists suggest. “Many, if not most recipients do not see Social Security and Medicare as government programs,” Edsall explained. “My guess is the vast majority of people do not believe Social Security and Medicare are redistributive.” But of course they are. A scholarly study cited by the Brookings Institution estimated that 40 percent of Medicare recipients do not believe Medicare benefits come from Washington. When retired people saw that Obama’s Affordable Care Act involved long-term Medicare savings of $710 billion, lots of them mistakenly assumed he was usurping their health insurance funds to help poor people. The strongest opposition to Obamacare was among the elderly who are already protected by the big government. The right-wing Republicans brilliantly exploited their fears and confusion (and Dems in the White House offered weak rebuttals). The GOP promised to protect old folks from the “socialist” president. The Republicans didn’t mention what they intend to do to Social Security and Medicare if they win the White House in 2016. Democrats have a lot of teaching to do. They need to call out the duplicitous conservatives trying to have it both ways. And Dems themselves need to demonstrate greater respect for the way ordinary citizens see things. Words like “inequality” and “income redistribution” are policy abstractions readily understood by policy wonks. But the policy debates can seem oddly distancing to citizens and even sow suspicions. If the country really is entering a new progressive era, it might start with more honest talk, less facile condescension.